We’ve been talking a lot this month about the Internet of Things (IoT)—about all its promise for businesses and consumers, its role when it comes to big data, and the risks that will accompany its rise. It’s inarguably both a powerful and challenging tool for all of us across the spectrum of enterprise, from marketers to, CIOs, to IT professionals. Some industries more than others stand to be revolutionized from the sensor-driven, uber-connected climate created by the IoT—not the least of which is healthcare. Let’s take a moment to explore both the possibilities and the obstacles of the emerging relationship between the healthcare industry and the IoT. We all want personal, quality care when it comes to our health. We want it to be cost-effective and, for the most part, we want to feel empowered throughout all parts of the process. The possibilities associated with healthcare and the IoT check all these boxes and more. Let’s take a look. Reduced cost. The cost of healthcare is not a topic discussed lightly. In fact, Business Insider reports that the U.S. spends 18 percent of its GDP on healthcare annually, and many government officials project that number to rise. Analysts at Goldman Sachs, though, have pointed to the IoT as the antidote: Their June report projected this “digital revolution” to save over $300 billion in healthcare spending. How does that $300 billion break down, exactly? As you can see from Goldman Sachs’ projection by vertical (Figure 1), the area of chronic disease management (including asthma and COPD) shows the most potential. That makes sense. Think of it this way: More sensor devices means more patient monitoring for chronic issues, and more patient monitoring means fewer checkups and unnecessary appointments—all resulting in cost reduction. Better care. That health tracking information Goldman Sachs referenced as a cost reducer can also help physicians provide better care. IoT-enabled devices can provide remote data from equipment like fetal monitors and electrocardiographs, among others. When information like temperatures, heart rates, and glucose levels are automatically transmitted in real-time via wearable devices, hospitals operate more efficiently and patients receive better care. All that extra data can help providers monitor patients’ sleep and exercise patterns and even determine their risk for heart attack or stroke. Empowered patients. The future of IoT-powered healthcare may allow patients to get expert medical advice without going to the doctor—and no, I don’t mean pulling up WebMD on your smartphone. Telehealth applications could allow actual doctor access without the waiting rooms. This connectedness could also be useful when it comes to behavior modification, as providers would have new tools to use when encouraging healthier lifestyles for their patients. Mobile hesitation. Devices are one half of the IoT, but what (or whom) they’re connected to still counts for something. If there is provider hesitation or confusion during any part of the patient data handling process, care could suffer or breaches could occur. 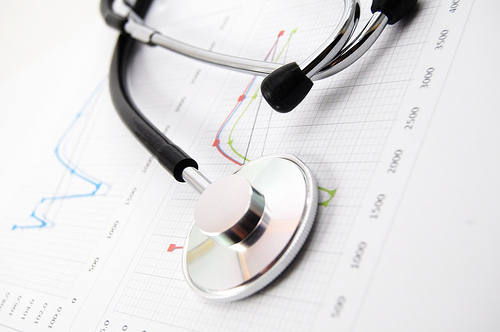 Some health IT departments and physicians have struggled to handle all that data coming in. Given the mobile, BYOD healthcare culture, substantial data handling training is required throughout an organization, not just at the top. Consistency issues. Consistency counts, especially in healthcare, and the introduction of the IoT into the field certainly does not negate that. So what are the communication standards and protocols for all these new medical wearables and other IoT-ready devices? Well, that’s sort of the problem: Medical device vendors actually haven’t agreed on them yet. A single hospital can use devices from a variety of vendors, raising questions of propriety and consistency. Security questions. Security was a huge topic of discussion at this year’s Health Information Management and Systems Society’s Annual Conference and Exhibition—the country’s main healthcare IT gathering—and for good reason. Presenters included the Department of Homeland Security and the FBI. When the number of internet-connected devices increases, so do the number of entry points into data systems—data systems full of sensitive patient healthcare and financial information attractive to cyber-attackers. Healthcare organizations absolutely must have security top of mind as they look ahead to the IoT. Even more security questions will arise as providers continue to delve into the world of mobile health apps, sometimes testing them in-house using containerization. The need for more and better data encryption will be front and center. Cost will become more of a factor in the wearables department, as companies will strive to develop lower priced, more practical devices offering healthcare connectivity through apps. “Smart hospitals” could pop up, built around streamlining the customer experience, everything from checking in at the front desk to settling in a room. Speaking of “checking in,” the marriage of predictive medicine and IoT (wearables and the like) will soon see your doctor calling YOU to tell you to get to the hospital, before that heart attack even happens. Now that is incredible, isn’t it? From your vantage point, what are your thoughts on the IoT as it relates to healthcare? In your opinion, are the potential benefits of reduced costs and better patient care outweighed by the numerous security questions that surround so much data? To that end, how should healthcare organizations approach that IoT-driven data influx? I’d love to hear your thoughts.